Tropic Skin Revive Firming Nourishing Cream is a firming day cream, designed to provide moisture to the skin and improve its elasticity. 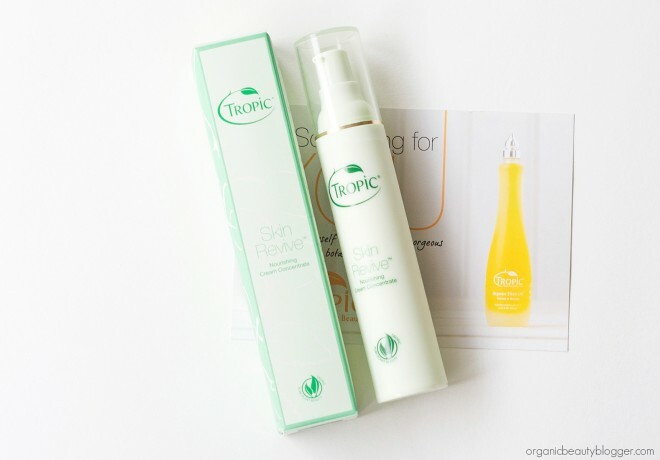 It’s handmade by Tropic Skin Care, a cruelty-free British beauty brand. This cream was the winner of Natural Health Magazine last year’s (2013) Beauty Awards, so I was curious to see how it will perform on my dry skin. It’s suitable for all skin types, which means it should be nonoily and hydrating. Skin Revive Cream comes in a slim, light green 50 ml bottle with a pump. It’s easy to squeeze out the right amount (even a tiny dab of it). Skin Revive is a thick cream, and it needs a good rub until it completely sinks in. However, once it does, it dries down without any stickiness, leaving my skin smooth and velvety. I can even see that it gives some radiance, too. An ingredient list (see below) of Skin Revive Cream is good. You’ll find aloe vera juice (hydrating and firming), macadamia nut oil (nourishing), frankincense (toning), echinacea (anti-inflammatory and healing), raspberry (brightening), chamomile (soothing), and rosehip (rejuvenating). Ingredients: Organic Aloe Vera Juice (Aloe Barbadensis Leaf Juice), Golden Jojoba Oil (Simmondsia Sinensis Oil), Macadamia Oil (Macadamia Ternifolia Oil), Rosehip Oil (Rosa Canina Fruit Oil), Avocado Oil (Persea Gratissima Oil), Shea Butter (Butyrospermum Parkii), Vegetable Glycerin (Glycerin), Coconut & Cassava Emulsifier (Cetearyl Alcohol, Cetearyl Glucoside), Candelilla Wax (Euphorbia Cerifera Wax), Soy Lecithin (Lecithin), Organic Grapefruit Seed Extract (Citrus Grandis), Vitamin E (Tocopherol), Corn Sugar Gum (Xanthan Gum), Sea Kelp (Algae), Echinacea (Echinacea Purpurea Leaf), Blueberry (Vaccinium Angustifolium Fruit), Raspberry (Rubus Idaeus Fruit), Camomile (Anthemis Nobilis Flower), Calendula (Calendula Officinalis Flower), Lavender, Organic Grapefruit Seed (Citrus Grandis Seed), Rose Geranium (Pelargonium Graveolens Oil), Sweet Orange (Citrus Aurantium Dulcis Peel Oil), Frankincense (Boswellia Carterii Oil), Potassium Sorbate, Sodium Benzoate, Essential Oil Components (Limonene, Linalool, Geraniol, Citronellol, Citral. Vegan. After using Skin Revive for about two weeks, I can recommend it to anyone who wants a non-greasy, fast absorbent, and nourishing day cream. If you have a very oily skin type, you might find it a bit too heavy, but for someone with normal, combination or mature skin types, it’s definitely worth the try. Tropic Skin Revive Firming Nourishing Cream can be purchased online for approx. $34/£22. 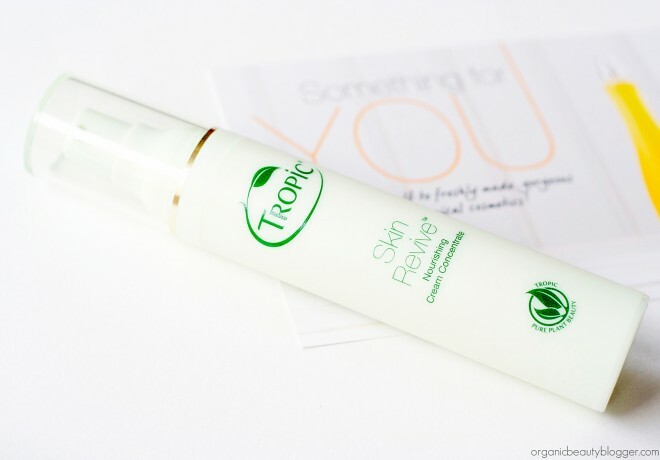 Have you tried Tropic skincare products? Sweet! Have you seen any lifting results? Or tightening? It does feel a bit tightening when I put it on, but I haven’t seen a big difference in the appearance of my deep wrinkles, yet. does this have any SPF in?? Hi Claire! Some oils and extracts in this cream (like macadamia oil, shea butter and raspberry leaf extract) are natural SPF sources. Depending on these oils/extracts, the cream has an SPF of about 6-10, which is suitable for low sun levels. However, if you need more protection, you should additionally use sunscreen or look for a day cream with mineral filters like Zinc Oxide and Titanium Dioxide.